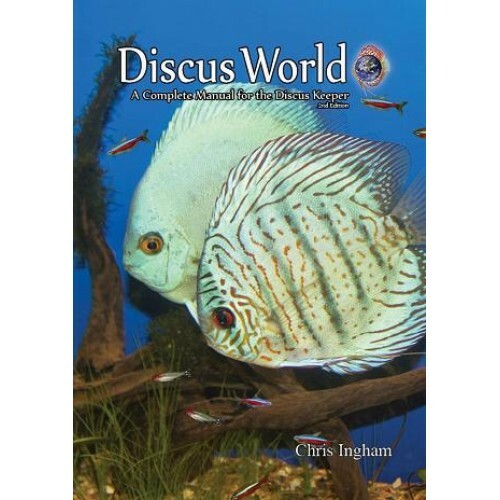 Discus World 2nd edition. The most complete up to date discus manual. Signed! Home » Discus World 2nd edition. The most complete up to date discus manual. Signed! NEW!! 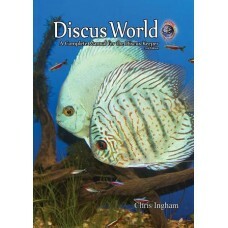 Discus World 2nd edition. The most complete up to date discus manual, signed! Now in a revised and fully updated second edition, DISCUS WORLD is the complete manual for the tropical discus keeper. Written in clear, easy to understand language, DISCUS WORLD is the indispensible reference guide for caring for these fascinating fish. Nicked named 'the new discus bible by its readers, ' DISCUS WORLD is a complete manual for the discus keeper. Now available in A4 size soft back to get cost down even lower, 176 pages and over 140 colour pictures, drawings and diagrams. It is written in clear, plain English and easy to understand layman’s terms. Keep nearby for a complete reference guide on keeping these fascinating fish. Make no recriminations; these fish will need lots of correct care, time and money. Do not skimp, or cut corners. If you do, they will let you know. Correct understanding; proper feeding, regular worming the same as you would treat other pets, and regular water changes should see healthy happy discus living for many years. Whither you are a new beginner, breeder, or well-seasoned discus keeper, a wealth of discus information is between these covers. About the author Chris Ingham has been keeping many types of tropical fish for over 40 years. This path has led him to keeping the ‘king of the aquarium’ the discus. Discovering discus changed life for Chris greatly, taking him around the world to places such as Singapore, Malaysia and many others to be at the world discus championships, Aquarama and visiting many discus fish breeding farms in the Far East. Discus soon took over his main job, where Chris set up Plymouth discus breeding his own discus, and then shipping them around the UK and even to Italy, France and Spain. He has also been the main guest speaker at fish clubs around Devon and Cornwall in the UK, giving talks and lectures on discus. At the end of 2003 he was asked to write for Tropical fish magazine, which went well, and he was soon asked to be the discus expert writing every month. He then went on to be on the expert team on the questions and answers page of the same magazine, which earned him the name of ‘the discus doctor’. Since then he has also written apart from his regular spot every month in Tropical fish magazine for Practical fish magazine, and tropical world magazine on his favourite fish, discus. Which discus should I go for, cultivated or wild? How to set up and mature a brand new discus tank. Setting up a discus tank on a low budget. Upgrading from standard tropical fish, to discus. Which discus water, RO or HMA?. Lighting and aquascaping the discus aquarium. My discus tank has sprung a leak. Starting up a discus business. Buy with confidence from Plymouth Discus Voted the UK’s No.1 Top Discus Retailer 2006, 2007, 2008, 2011 and again for 2012 By Our Customers, & Practical Fishkeeping Magazine Readers Poll.